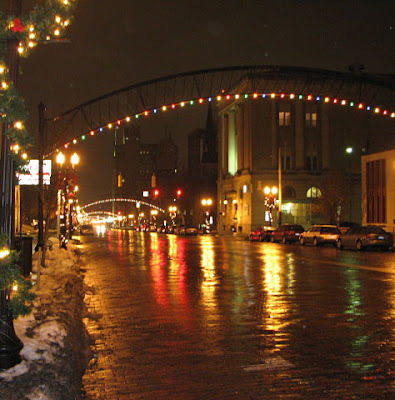 Flint Expatriate Randy Gearhart recently visited Flint and provided these photos of Saginaw Street decorated for the holidays. And as the final shot shows, Flint is no longer "The Vehicle City." I took these photos between 7:30 and 8:00PM on December 3rd. It was cold, with a misty rain wetting the bricks. And, you're right, Grumkin, there wasn't a whole lot of traffic--except for a smattering of cars in the Haloburger drive-thru. I really wanted a couple burgers, some fries, and a Boston Cooler, but I'd already had a Steak and Shake bacon and cheese double in Macon earlier in the day on my way to the Atlanta airport. "The Future Lives (somewhere) in Flint!" I s'ppose don the con was the perp in changing that historic sign. figures. I believe the arch at the other end of the street (closer to Carriage Town) actually says Vehicle City. Here is a link to a photo of the current arch which does say "Vehicle City"
Brian & Becky are correct. 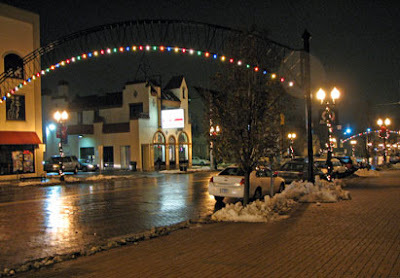 The 'Vehicle City' arch is at 1st Avenue, just north of the Flint River, the same place it's been since 2003. 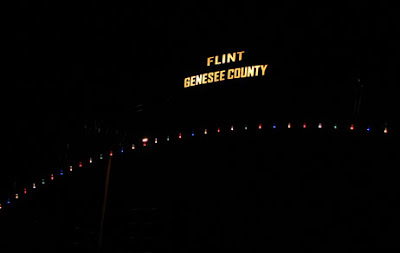 The 'Genesee County' arch is located by City Hall and the county administration building. That arch, and one in front of the courthouse that was sponsored by GM, were installed in May of this year. Keep in mind, 'Vehicle City' had nothing to do with cars. That was from when Flint was the largest producer of carriages - and those have been gone for a century. Sorry for any confusion, y'all. Thank you, Brian and Becky and Scottr for setting the record straight. Great photos- love seeing Haloburger, the Masonic Temple and First Pres (my old home church) again. Dad was a partner at Dupuis & Ryden CPA, which was on Fourth and Harrison, a half block away. 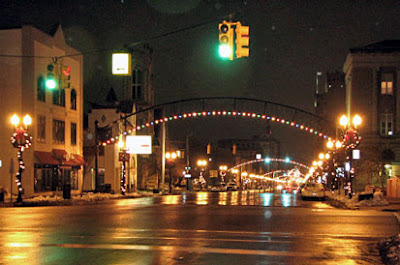 ChurchGuy, Thanks for posting the pics of downtown Flint. I used to work in the Phoenix building across from Halo Burger. 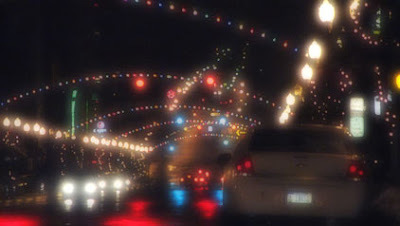 Having lived in Macon for 16 years now, the photos brought back great memories of my hometown. I'm glad you enjoyed the pics. I live in Rentz (for the past three years), just down the road from you (assuming that's Macon, GA). Over the years I've lived in Lenox (3 months), Tifton (2 years), Dublin (8 years), and Ft. Oglethorpe, GA (1 year). I'm loving the weather here this week. 80 on Thursday (in December)--I can handle that. I don't know about you, but, I don't miss the cold MI winters (all 6 months or so of them). However, I must say that Christmas music really does work better with snow. But now I have a New Year's Day dilemma--MSU vs. GA in the Capital One Bowl. Well, not really--GO STATE! 8o degrees. it was 20below here last night. yeah...go state. wee. Hey ChurchGuy, I've been to Rentz several times when I worked for Federal Express. I do love the winter weather in Georgia but I miss the sweet summers and falls of Michigan. I also pine for my Halo Burgers, coneys and trips to the apple orchards in the fall. I always tell my wife (a native Georgian) and friends that you can take the boy out of Flint, but you can't take Flint out of the boy. Flint, in its heyday, was a great place to be a kid. Right out of "Leave it to Beaver". Georgia is a wonderful state but Michigan, and more specifically Flint, will always be home. Now, could someone please get me two up on one?